Published in the April 2011 NAWCC Bulletin, starting on page 202. Have you ever held a small pan full of sand or brass shavings over an open flame and watched a clock or watch part (say a hand or perhaps a screw) slowly change color? If you have tried this you have probably learned that patience is a virtue and that touching pans held over a gas flame tends to make one a bit cranky. I remember my mentor, a retired railroad watch inspector named Ray Ashcraft, demonstrating the technique. As with all of the things he showed me, each piece he blued turned out perfectly, without the need to get salve for burnt fingers. Or the need to re-polish a piece when it was heated a bit too long and turned a drab gray. Fast forward a few years and I am managing an effort to develop a novel titanium alloy. Now, honestly, did I know anything about metallurgy? Uhhh, no. But, I did know how to evaluate experimental data and how to guide research. With this I was in charge of a development effort that was staffed with several very knowledgeable metallurgists. As in PhD metallurgists. While the effort turned out to be for naught, it did give me a chance to develop an understanding of how to heat treat steel. As for the research, if you are curious, look up metastability. We had a fantastic alloy that resisted corrosion like no ones business, unless it was scratched. Then it corroded like gang busters. But, between experiments I wrote up what the metallurgists explained to me, at times borrowing texts to help me understand some of the concepts. When I was done I had a document that I have referred to over the years to help me understand what happens when I heat steel. When I write up documents like this I tend to write in an outline format. This article is based on the outline I put together many years ago, with text added to emphasize points I think are important. When do I heat treat? Most often I am heat-bluing screws or clock hands. In my restoration work I clean up all the screws in a mechanism and then re-blue them. I leave the screws in the oven for an hour or longer to stress relieve the screws – so that they have less tendency to break when reinstalled. I also polish hands until they are bright and shiny and then blue them. Unless the hands have been soldered in the past – heating them to blue the steel would also melt the solder. In addition to the color and stress relieving, bluing is an oxide layer that helps fight corrosion. While not corrosion proof, the oxide layer is an improvement on bare metal. I also heat treat pallets (harden them) when I find that the pallets are soft. Soft pallets leave a trailing lip of thin metal on the edge of the pallet when ground. This lip of metal degrades the performance of the pallets while making it difficult to achieve a clean, crisp edge on the pallet faces. I harden soft pallets to their hardest state before continuing to work the faces. Fortunately, when properly hardened the pallets grind with a clean, sharp edge. I sometimes find when replacing a broken pivot that the arbor is hard enough that high-speed steel drill bits do not readily cut the steel. I will typically soften just the end of the arbor to make it easier to drill. Of course, if there is pinion right at the end of the arbor that needs re-pivoted I do not soften the arbor; it is always best to leave pinions as hard as possible. In those cases I get out carbide bits and carefully drill the hole. Speaking of hard arbors and pivots, my experience with the wonderful round French mechanisms, the classic “Pendule du Paris” pieces made in the 1800’s has taught me that the arbors are not readily softened for drilling. Apparently the French used very hard steel with sufficient carbon to form excessive carbide inclusions. These inclusions hinder cutting no matter how soft the surrounding matrix. This conclusion is supported by the very fine grain I see on the end of a French arbor where a pivot used to be. In the case of French arbors, I use carbide gravers and drills. The other time that I will heat treat is when I need to cut a fairly small pivot. Typically I can turn down around 0.013 inch pivots in reasonably soft steel. But, if I need to turn a smaller pivot I will harden, and then temper the pivot once I have cut down to around 0.013 inch. With the pivot hardened I continue to cut, with a carbide graver, down to the desired diameter. The hardness and strength of carbon steel can be changed through hardening, annealing, and tempering. Annealing (Slowly cooling a red-hot piece of steel) is used to soften steel so that it can be bent and cut easily. Hardening (Quickly cooling - quenching - a red-hot steel) is used to make a very hard and brittle steel. 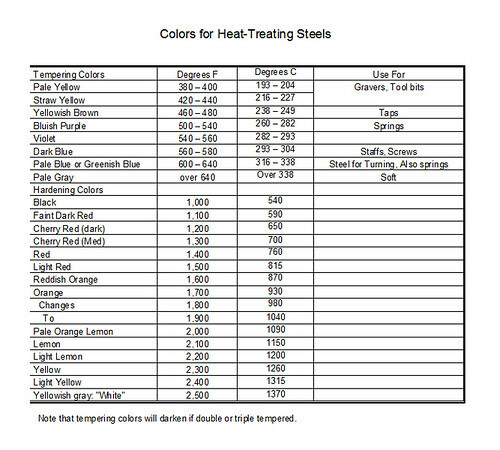 Tempering (Heating to a desired temperature/color) is used to make very hard (hardened) steels stronger and less brittle. Annealed steels can not be tempered since they are already soft. Oil-hardening steels are alloyed (contain chrome and nickel) which allows them to be quenched at a slower rate than water-hardening steels. Air hardening steels are even more highly alloyed and can be quenched very slowly compared to water-hardening steels. Needless to say, air-hardening steel costs more than oil-hardening steel, which in turn costs more than water-hardening steel. Oil-hardening steels can be quenched in water but water-hardening steels should not be quenched in oil. For the most part I buy oil-hardening steels and then water quench with a layer of oil on the water. Safety – In this article I refer to temperatures in degrees Fahrenheit – when you see the letter “F” by itself this means I am referring to a temperature in degrees Fahrenheit. I also provide roughly equivalent temperatures in Centigrade in the table – where I use “C” to so designate. When you see numbers higher than 120 F (50 C) you should be aware that the metal is hot enough to burn you. My experience has taught me that I can almost hold a piece of metal at 120 F, though there is some discomfort. Touching a piece of metal at 400 or 500 F skips the uncomfortable part and goes directly to burn. A little planning before you start dealing with hot pieces of metal will improve your chances of enjoying the process (not to mention keeping you skin and the surrounding surfaces intact). Keep a fire extinguisher handy. While this should be a no brainer, I have to remind myself when doing something I have done a dozen times before. If I drop the work piece where will it land? What can I put there to keep it from scorching a bench or melting carpet? As I am getting ready to heat treat I remove all readily flammable items (cloth, paper, any solvents or other inflammable liquids) from the area where I am heating a work piece, and place fire brick where the work piece will fall if I accidentally drop it. Is there a safer way to treat the work piece? Much of my work is focused on tempering steel. Most tempering operations (and heat bluing for that matter) can be done in a household oven. These ovens are designed to handle temperatures up to around 550 F. It is possible to place the work piece in an oven, close the door, heat to the desired temperature, check the color using a kitchen pot holder to pull out the rack, and finally let the work piece cool on the rack with the oven off and the door open once the desired temperature/color is achieved. And, a work piece can stress relieve in an oven for an hour or two without your intervention (can you imagine trying to hold a pan of sand over an open flame for even a minute at a reasonably constant temperature?). Steel wool – a fire hazard? I often use steel wool to polish a work piece in preparation for heat treatment. It is very important to realize that steel wool will readily “catch on fire” (“exothermically oxidize” to a technical type). While it might not be obvious that a piece of steel wool is oxidizing merrily away, steel does oxidize at a fairly high temperature and can, if left unattended, ignite paper, cloth, and even a wooden work bench. I keep a steel cylinder on my bench for storing steel wool. I do not leave steel wool loose on the bench if I am doing any metal working, even a spark from a grinder will ignite steel wool. And, once ignited, steel wool burns around 2,500 F (1,400 C). When heating a work piece held in a pair of pliers, consciously remind yourself that it is not ok to grab the work piece if it slips out of the pliers. Or a work piece that is falling off of a fire brick. Don’t wear rubber gloves or clothing that is loose enough to get ignited. I will often wear a pair of thick leather gloves when working with very hot metal. Or an oven mitt. Not that either the leather or the mitt will handle temperatures over 600 or 700F, its just that the layer of leather or heavy cloth will give me a moment longer to realize I should quit touching the hot workpiece before I burn myself. Rubber or plastic is totally unacceptable in that it will melt and adhere to your skin. And even burn if given a chance. Quenching – pop, splatter and burn! Quenching cherry-hot steel in cold water is simple and, provided there is sufficient water available to effectively cool the work piece, pretty safe. This changes in a hurry when quenching in oil. The oil can splatter you (risking skin burns or worse if the oil ignites) or the oil can ignite in its container when you quickly lower the work piece into it. I find that the best approach is to have plenty of oil so the work piece can be lowered into it quickly without risking splashing or part of the work piece remaining above the surface. I also keep the quench oil in a container that can be readily covered if the oil catches fire. As part of my planning I set a cover beside the quench oil to make sure I am ready if a cover is needed. In fact, I typically do a dry run of the motions I will use to heat the work piece and to quench it. This helps me identify where I might get in trouble (ever wonder why we don’t have a few more hands, instead of 10 thumbs?). In summary, it is very important to plan out the steps you will take and plan what you will do if (when) things go wrong. If in doubt, a large, metal bowl of cold water placed where you can drop a work piece into it is not a bad safety precaution. Heat the work-piece to cherry red (table salt melts at 1480, a good indicator of the correct temperature, or you can check to see if the steel is “non-magnetic” – as discussed below) and then cool the workpiece slowly - in warm air, in a pail of ashes, or placed on a fire brick or a heat pad, or better still, in a warm oven. Or, you can withdraw the flame very slowly if using a torch. Heat the work-piece to cherry red, and quench rapidly in water (or oil, or air, depending on the quality of the steel) to obtain a "glass hard" product. When longer pieces, such as arbors or punches, are immersed in water, be sure to plunge the workpiece straight in lengthwise, with the end that needs to be hardest first. When hardening a cutting tool you can have some decarburization (carbon in the steel is burnt out near the surface), it is good to grind off the surface to get to hard steel. Use steel-wool or fine emery paper to remove any surface oxide and expose fresh, shiny metal. Slowly heat the work-piece until the desired color is achieved: The hotter the piece is heated, the softer the product. 400 to 450 F (200 to 230 C) - Light Straw Color - Suitable for punches and steel gravers, will cut/punch steel that has been tempered to a blue color. Roughly 500 to 600 F (260 to 320 C) - Blue - Suitable for balance staffs and most hardened pieces. Soft enough to be machined, yet hard enough to withstand wear. While a work-piece is tempered as soon as the temperature reaches the desired point through out the piece, leaving it at the tempering temperature for an hour or two increases toughness and reduces hardness. And, while the ranges of temperatures shown above might seem a bit wide, start at the low end of the temperature range, let the workpiece “come to temperature”, then check the color. If the color isn’t right I increase the temperature in 10 F (5 C) increments until you get the color you want. In truth, most steels that I work with exhibit a very nice blue color in the 500 to 530 F range. Note – this is within the range that can be readily achieved in most home ovens! Protecting fine threads and holding small pieces - Wrap bailing wire around piece to hold it, as well as to protect fine threads from oxidation. Since salt melts at 1480 F (800 C), a good practice to recognize achieving the temperature necessary to harden steel is to drill a hole in the end of a piece of the appropriate steel, fill it with salt, and observe when the salt melts when heating. This is hot enough to harden most steels. If you see scaling on the steel you are around 1550 F (840 C), too hot for most steels. When hardening or softening the pivot on an arbor it is best to indirectly heat the pivot by transferring the heat through a piece of brass rather than applying the flame directly to the arbor. I drill a hole in the end of a brass rod, and then use the rod to heat, and protect the pivot when heating. The hole is roughly the diameter of the arbor and deep enough that the pivot and a length of the arbor roughly equivalent to the diameter of the arbor will slide in. The rod should be at least two times the diameter of the arbor. With the pivot and the end of the arbor in the hole I can heat the brass rod a half inch or more away from the end of arbor and transfer heat to the pivot through the brass. I monitor the color of the arbor/pivot just outside of the hole in the end of the brass rod judge when I have achieved my desired temperature. As with all heat treating using a flame, proceed very slowly, it is amazing how quickly an arbor can heat up. Steel becomes progressively more hardenable up to around 0.8% carbon. Higher levels of carbon increase the wear resistance but do not have much impact on the hardness. If the red-hot steel is cooled very quickly (quenched, or hardened), the iron and carbon form very small crystals with the carbon evenly distributed throughout the steel. This produces very hard, brittle steel called Martensite. This steel can be tempered to a wide range of hardness to make it less brittle and more workable. Note that when cooling a thick work-piece, it is not uncommon to find that the center of the work piece has not achieved the fine crystalline structure because it did not cool as quickly as the outside. This is why oil-hardening steel can be worth the added expense – it is easier to work with and is more forgiving in the time allowed for cooling. If the steel is cooled very slowly (annealed) the iron and carbon produce two separate crystalline forms, one being nearly pure iron (Ferrite), the other being iron carbide (Cementite). These two materials form separate layers: the slower a steel cools, the thicker the layers, and the softer the steel. Annealed steel can not be tempered but can be bent and cut easily. The hardening temperature influences the grain size distribution, Under heating results in a coarse grain, while the steel grain distribution is irregular and the steel is brittle when overheated. The strength of steel is also influenced by the carbon content: the higher the carbon content, the more carbon there is to make iron carbides, and the harder the steel will be for a given cooling rate. Interestingly, the higher the carbon content, the lower the critical temperature to which the metal must be heated for proper hardening. Steel can be hardened several times, but each time the steel is heated red-hot a bit of the carbon in the steel is oxidized, resulting in a progressively softer steel. The maximum hardness for a given steel is achieved by quenching quickly from red-hot. The actual hardness achieved will depend on the carbon content of the steel. A steel containing 1% carbon will be harder than one containing 0.4% carbon. For most steels the optimum temperature to obtain the toughest steel is 1450 F (790 C). Likewise, the optimum temperature for tempering is around 350 F (180 C). A much softer steel will be produced by slowly cooling from red-hot. The slower the cooling rate, the softer the steel. Hardening - Treating a steel so that is very hard and strong, but brittle. Steel is heated to red-hot (note - red-hot steel is not magnetic) and then cooled rapidly by quenching in oil, water, or brine (salty water). Quenched steel is very hard and brittle; It may crack if dropped. If you wonder if steel is hardenable, try hardening a piece and then test it by seeing if it will crack when bent. You can also notch a piece to control where it breaks. When it breaks, look at the texture of the break. Wrought iron is fibrous and stringy, steel is crystalline with a grainy structure at the face of a break. Oil-hardening steel requires a more highly alloyed composition. The increased alloy content slows down the formation of the layers of ferrite and cementite, allowing more time to form martensite, the desirable and very hard steel. Water-hardening steels - Have to be quenched very quickly to form martensite. Adding salt to the water makes it a more effective coolant, while making the water less prone to forming bubbles around the hot steel. An indication of the correct amount of salt is when a potato just floats in the solution, or roughly 3/4 pound per gallon of water. Water-hardening steels have fewer alloying components. Less alloying means the ferrite and cementite form more quickly, so the steel must be quenched faster to get hard martensite. Faster quenching with water increases the risk of distortions in the work-piece. The risk of pulling carbon out of the steel is reduced if the water has a layer of oil on the surface – the oil tends to coat the workpiece as it is lowered through the oil into the water. Whichever type of steel is used, it is important that long objects, such as arbors, be plunged into the quenching liquid on end, not on their sides. Plunging on end minimizes the risks of warping arbors or other long objects. Ductility - The ability of a metal to change shape before it breaks. Quenched steel is very hard but not ductile; in fact it is very brittle. Tempering is needed to impart ductility (while reducing brittleness) to the quenched steel, usually at a small sacrifice in strength. Annealing - Treating steel so that it may be bent and cut easily. Steel is heated to red-hot and then cooled very slowly - often in an oven so that the temperature can be brought down at a slow, controlled rate. Alternately, when using a torch, you can withdraw the work-piece slowly from the flame to extend the cooling period. Normalizing is a form of annealing where the steel is cooled in air. Normalizing will not make steel as soft and workable as annealing. Steel that is bent when cold has a tendency to harden in the deformed areas, making it more difficult to bend and more liable to breakage. Alternate bending and annealing operations are performed on most manufactured steel products to minimize the negative impacts of work hardening. - Reheating hardened steel to a set temperature for a set time and cooling back to room temperature makes steel tougher and more shock resistant but reduces the steel's hardness and strength. - Tempering results in the formation of tiny carbide particles in the steel, but does not change the grain size of the steel. - Quenching steel that has achieved the required temperature for tempering does not decrease the effectiveness of the tempering. - Annealed steel is already soft, it can not be tempered. An example: Heating a punch that has already been hardened to make it less brittle. The tip of the punch is heated to a light straw color (about 430 F (220 C) by gently heating the body of the punch and monitoring the progress of the color change up the shaft. When the last half inch of the punch begins to change to a straw color, remove from heat and plunge straight down into water. Stress Relieving - Heating a steel to relieve internal stress and thus prevent distortion or cracking during machining. Chrome and nickel are added to delay the formation of a two-phase microstructure. This allows the steel to be quenched more slowly without giving up any hardness. Such steel is said to be more "hardenable" than steels that must be quenched quickly. Likewise addition of chrome and nickel allow for a more consistent hardness throughout a thick piece of steel when it is quenched. Hardenability should not be confused with hardness: Hardenability refers to a steels ability to be hardened throughout a thick piece of steel, whereas the hardness that can be achieved in a given steel depends on its carbon content.